“All hands on deck! We’re weighing anchor under sail!” the announcement was second or third hand by the time it arrived at my ears. Not knowing what this meant, but sensing the excitement, I ducked out of the galley and hurried to unlatch the heavy waterproof case that held my camera. By day three, I was getting used to switching gears between Assistant Cook and Communications Coordinator. As I made my way up towards the commotion, I was interrupted by a deep mechanical rattling coming from the forward-most compartment. Four hands were not on deck. They were hovering over a multisided wooden box nestled between the bunks and hidden by an angled table. The chain locker. A conversation from the office lunch room came rushing back to me. The weight of the camera in my hand brought me back to reality. I should be taking photos of the hauling up on deck, not hanging out in the low light and cramped quarters of the foc’sle. But I couldn’t turn away from the sight before my eyes. The heavy anchor chain was pouring in through a metal shaft jutting out of the ceiling. “Yours!” One of the trainees called out. Without hesitation, his partner grabbed a link of the chain and hauled as hard as she could towards her corner of the box. “Yours,” she yelled back over the clamour of metal against wood. He copied her motion, pulling the next section of chain into a zigzag pattern. Salty green mud splattered their arms and quick moving links threatened to pinch fingers. With cascading metal involved, there was no time to complain or tease or doubt each other’s abilities (as thirteen-year-old boys and girls usually do). It was teamwork in its most basic form. I was so impressed that I had to mention the interaction to the group’s chaperone. “Those two, working together?” her face filled with a mix of pride and disbelief. A few hours later we were well underway and picking up speed with the late morning wind. My watch group was in the hold gulping down mouthfuls of steamy chowder when feet appeared on the ladder above our heads. A stream of damp trainees scrambled down. They were responsible for watch and their appearance sparked surprise and then alarm. “We were told to grab our safety harnesses,” explained a few. We had been eating with our bowls in our hands for fear of capsizing our lunch, but we hadn’t realized the increasing severity of the conditions outside. Now I should remind you, that my closest companions on that sea-faring vessel were all seasoned sailors and so I tried to maintain my composure. They were casual and had certainly seen a lot worse. But to me and the other twenty-two people on board, this race for the safety harnesses was cause for some concern. A nervous trainee asked one of his chaperones what to expect. This teacher had sailed with SALTS regularly for the past decade, but his expression was severe. “This is big stuff,” is all he said securing the belayed and coiled rope in his hands. One-by-one trainees grew increasingly motionless on the deck. I sat near the bow and took her advice. Staring straight out over the waves seemed like the best way to convince my brain that I was enjoying the rollercoaster sensations, while appearing casually meditative. My chowder was still silently churning away, but several others had already lost theirs to the fishes. There was some stirring amoungst the trainees huddled against the damp deck wood. No one appeared from below. One boy was completely passed out near the wheel house. 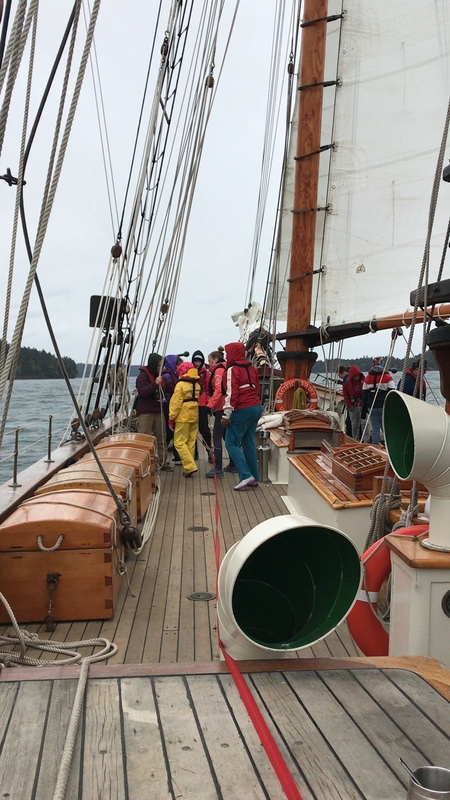 “Seasickness effects everyone differently,” a co-worker had explained it to me weeks before, “some get sleepy, some get hungry, and some just barf.” I could see the full range of responses around me and I couldn’t imagine anyone mustering the strength to haul. Slowly most of the girls, one boy, and two teachers rose to their feet. I glanced towards the hatch wondering if any of the boys would show their green faces. On day one they had been the most eager participants, the first to haul, the first to climb, the first to assume competence. Most of the girls had taken a more cautious approach. They took up the slack on the ropes the boys were hauling and observed before volunteering. But now it was those girls who showed up. I was amazed, but not surprised at their resilience. They had steely determination written on their faces and untapped power in their shivering arms. Together we refastened our safety harnesses on the starboard side and readied ourselves for hauling. There was some discussion at the wheel. Port side. We unclipped again and teetered our way over to the opposite side of the deck. More discussion. Actually hold off on the hauling. “How much further?” asked a watch leader. “I think we should do whatever will make them less miserable,” replied the watch leader glancing towards those who were still huddled on the deck. And with a nod, the skipper gave the order. Within seconds the nauseating rolls stopped. Sun broke through the clouds. Birds may have begun to sing. Colour returned to faces. I looked around half expecting Jesus to be standing on a few potato sacks somewhere with his hands raised serenely demanding the wind and the waves’ obedience. Really the only miracle at that moment was the combined force of four crew members problem solving, but I’m not saying Jesus wasn’t involved. The other miracle of that day was more subtle. I had written something in my journal that morning about my struggles with teamwork and the application of my pondering was becoming increasingly real over the course of the day’s events. As an independent-minded competitive high-achiever, I am always looking for ways to be the best or to excel. But there are no superstars in sailing. There’s no extra credit for my small role in holding that wooden world together. As long as I clung to a success-oriented identity, I was oil out there on that water. We are each adrift without each other and sometimes I find that hard to admit. But not on that day. 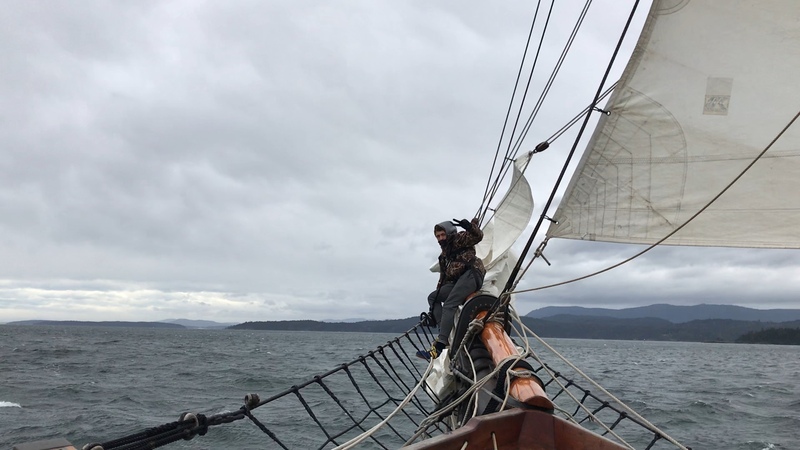 That stormy day in the Salish Sea, I was too busy marvelling at the miracle of thirteen-year-olds hauling anchors, seasick sailors mustering their strength, and leaders who knew when to change course. All I needed to do was watch, listen, and pull my section of the rope. Thanks Meghan. Inspiring, and interesting of course. Here on land, we often declare: “all hands on deck” to get a task done but then no one is fighting sea-sickness or dealing with a weighty anchor. Love the part you wrote about Jesus. His calm presence is what his disciples needed then and what we need now.